Ransomware can result in a cascade of costly failures, crippling your company’s critical systems. A simple click of a link or attachment in a malicious email can inject an employee’s computer system with malware that encrypts the user’s files and quickly targets and infects other vulnerable systems like network file shares, local backups, and even backups on the cloud. 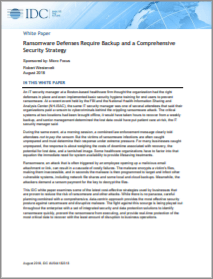 Download this IDC white paper to learn about the latest cost-effective strategies proven to reduce the risk of ransomware and other attacks.